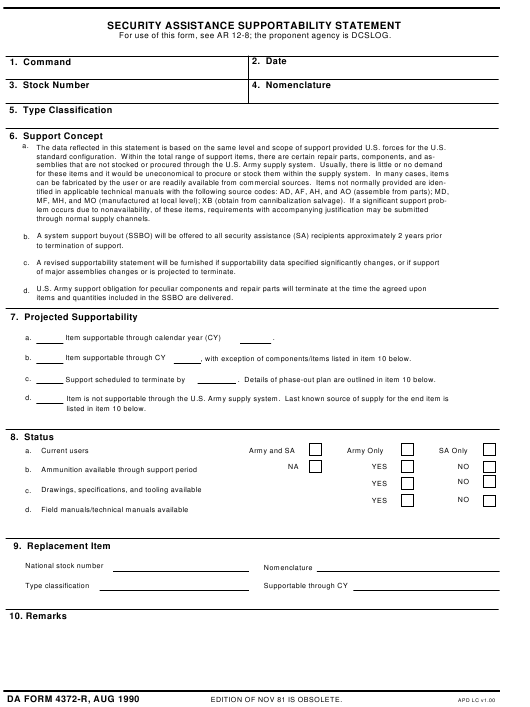 DA Form 4372-R - also known as the "Security Assistance Supportability Statement (lra)" - is a Military form issued and used by the United States Department of the Army. The form - often mistakenly referred to as the DD form 4372-R - was last revised on August 1, 1990. Download an up-to-date fillable PDF version of the DA 4372-R below or request a copy through the chain of command. The data reflected in this statement is based on the same level and scope of support provided U.S. forces for the U.S.
of major assemblies changes or is projected to terminate. items and quantities included in the SSBO are delivered. , with exception of components/items listed in item 10 below.
. Details of phase-out plan are outlined in item 10 below. listed in item 10 below. EDITION OF NOV 81 IS OBSOLETE.